Not to sound like a total lush, but I really really missed margaritas when I was pregnant. And it's not like I drank them all the time before, but knowing that I couldn't have one made me want one that much more. Forbidden fruit and all, I guess. I finally got to enjoy one when Smith was a few weeks old, and it was deeelicious. This chili is a basic turkey chili, but with the added flavors of tequila and lime - kind of a "margarita chili" if you will. But way less weird than it may sound. The tequila is definitely subtle, but it adds a great depth of flavor. And the addition of lime juice and zest adds a nice bright freshness. We really liked this chili - it had just enough spice to keep it interesting, with just a touch of sweetness. The leftovers just got better as the week went on, and I enjoyed it for lunch every day. Any time I can get away with tequila at noon is a good day by me! Mash the bread and milk into a paste in a large bowl using a fork. Mix in the ground turkey, 1/4 tsp salt, and 1/4 tsp pepper. Heat the oil in a large skillet over medium-high heat. add the onion, bell pepper, and jalapeno, and cook until they are softened, 5-7 minutes. Add the chili powder, tomato paste, garlic, cumin, and oregano and cook an additional 3-5 minutes. Stir in the turkey and cook, breaking up any large pieces with a wooden spoon, until no longer pink, about 3-5 minutes. Stir in the tomato sauce, scraping up any browned bits. Transfer the mixture to the slow cooker. To the slow cooker, add the diced tomatoes with their juices, beans, 3 tablespoons of the tequila, soy sauce, honey, and chipotles. Cover and cook on low until the turkey is tender, 4 to 6 hours. 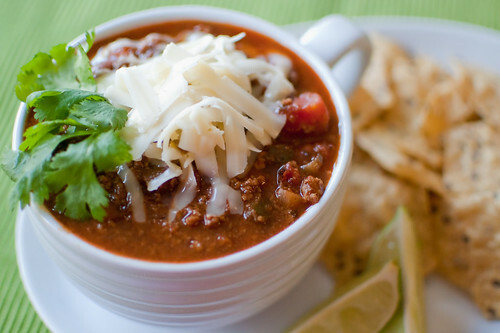 Turn off the slow cooker and allow the chili to settle about 5 minutes. Use a large spoon to skim the fat off the surface. Break up any remaining large pieces of turkey with a spoon. Stir in the remaining tequila, lime zest, lime juice, and cilantro. Taste and season with additional salt, pepper, tequila, and lime juice as desired. Yum! Can't wait to give it a try! I see so many ingredients that I love... chipotle in adobo, cilantro, jalapeños, and, well... tequila - of course! I'm sure I'll miss margaritas too ~ whenever that preggers day comes! How interesting! I could never in a million years have come up with this combination, but it sounds brilliant! The ingredients sound AMAZING! YUM! I'm just passing by and thought id say hello. We will be receiving some snow this weekend in Pennsylvania, and the leaves are just about at their peek colors. I hope everyone has a very nice weekend. Richard from Amish Stories. Love this idea! Thanks for sharing, Josie! This looks so good! I love putting a fun spin on chili and can't wait to try this. So funny.. my little lady was born very close to Smith, and I just had my first margarita a few days ago and made some similar soup in the crockpot - I wish I had had this recipe, however .. because it sounds glorious! It's making the list! Thanks for sharing..
A great recipe for my special dinner with my sister. I had to pin this! I love anything with lime! and the tequila helps too! Although it sounds fabulous, anything that requires pre-cooking of so many ingredients does not qualify as a proper slow-cooker recipe. imho. Anonymous, As long as it's cooked in the slow cooker, it qualifies as a "proper slow cooker meal" in my opinion. I'm sure it could easily be adapted to the stovetop though. My mom gave me a slow cooker for my birthday a few months ago, and I finally broke it in yesterday with this recipe. It was soooooo good! Thanks for the post! Jennifer, I'm so glad you liked it! This sounds amazing. I can't wait to try it. I have been eating more turkey and chicken so this is great for me. Not to mention my love for Marguaritas and lime.. Thank you..will try it for sure. I just made this tonight for dinner and it was SO good. My husband even enjoyed with the ground turkey. 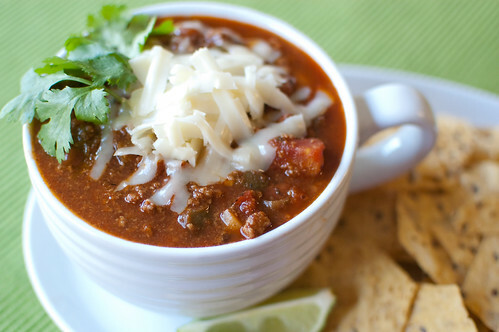 Love this tequila lime twist taste on typical chili. Sooooo YUMMY!!! I had to stop and write back and tell you I made this tonight in my crockpot and it was a big hit! I just love it, and love that I have it now in small containers in the freezer! I am even sharing one portion with a coworker tomorrow as he was intrigued when I told him what I was cooking today. Thank you so much.